"Picture 11 miles of smoothly paved bike path meandering through the countryside. Largely uninterrupted by roads or intersections, it passes fields, backyards, chirping birds, a lake, some ducks and, at every mile, an air pump. For some Danes, this is the morning commute. . . . Danish statistics show that every 6 miles biked instead of driven saves 3 1/2 pounds of carbon dioxide emissions and 9 cents in health care costs. 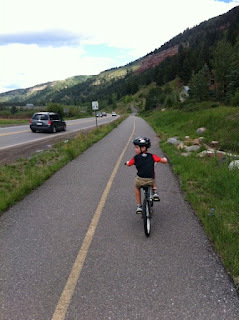 But many cite happiness among the chief benefits of bicycle commuting." I have to agree with the connection between cycling and happiness. 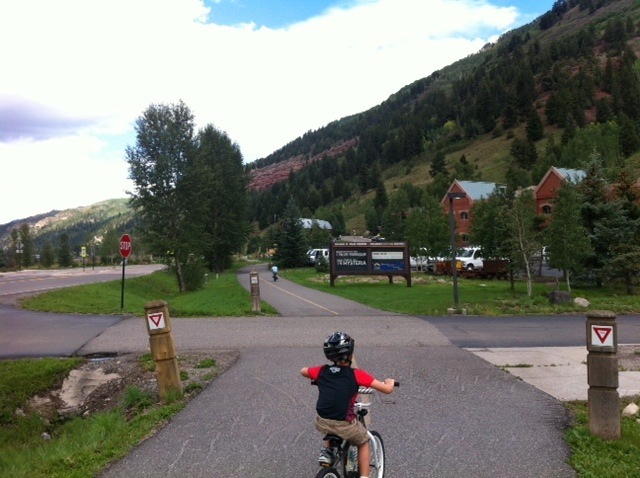 My extended family is currently visiting Telluride, Colorado, where today we discovered our own "superhighway" for cyclists. Lovely! Imagine: What would it be like to have a network of 26 dedicated cycling paths connecting different parts of your city to downtown? In Austin, the Lance Armstrong bikeway (which connects a section of East Austin with downtown and Mopac) is one step in the right direction, but we have such a long way to go as a city. The Copenhagen model is inspirational. I get really excited about the possibility of places -- and one of my latest obsessions is urban alleys. 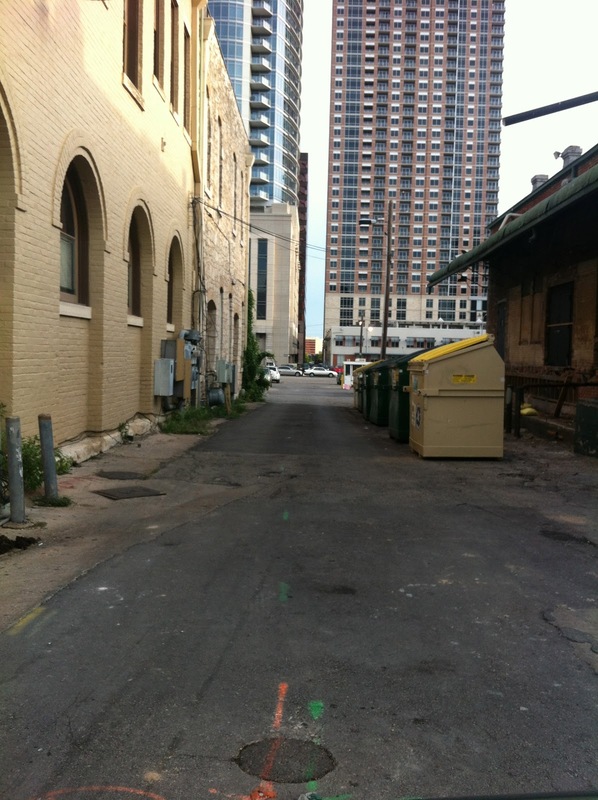 In downtown Austin, these are blighted, deplorable places -- an underutilized resource in a densifying city. Through my work on Austin's Downtown Commission, I am hoping we can set up a workgroup to figure out ways to convert these spaces into vibrant public places for folks of all ages. 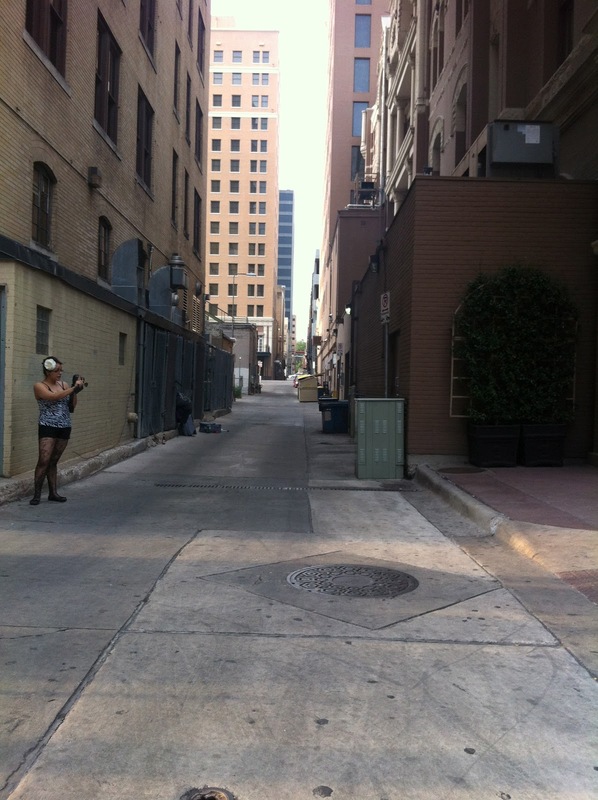 Imagine all the possibilities for these alleys in downtown Austin. Ideas? I found tons of inspirational examples of fabulous urban alleys online today, which I have added to two Pinterest boards (I just discovered Pinterest this week; A Pinterest Follow Me button is also now up on my blog home page). One of the best alley conversion projects in the country has to be The Alley Art Project project. Their mission is to "reclaim alleys for pedestrians, making the neighborhood more lively and sustainable." Check out their website to read about all the cool stuff they are doing. Ok, before retiring for the night, I have to also post a link to this melt-your-heart-delicious video of a flash mob symphony that was posted on our neighborhood listserve. This totally captures what I mean by magical public spaces. As my neighbor who posted this on the list serve wrote, "We should strive to create spaces where events such as this can happen." Enjoy! So, after eating zillions of ice cream cones, chocolate croissants, chunks of manchego cheese, and more, how much weight did Which Way blogger gain in Spain? NONE! I couldn't believe it. I'm convinced it was all of that walking and biking we did. And how much has our family walked or biked together since we got back home 10 days ago (except for to and from our cars)? Zilcho! So, I have resolved that our family is going to do more walking and biking outings together -- even in the heat, bad streets, lack of shade, and all. Unfortunately, if we want to get far on our bikes as a family, that means navigating some treacherous streets here in Austin. Many of the bike lanes near our house look like this one on South Lamar, with unbuffered lanes right next to cars zooming by at 45+ miles per hour. Gotta appreciate this quote from one of the NYC council members about the NYC Slow Zone project: "Our streets are not for drag racing, they are where we raise our children, shop at local establishments, and say hello to our neighbors." Here, here. As part of the NYC project, the Slow Zones will be marked with prominent blue gateways with large signs, speed bumps, and "20 MPH" marked on the street. We need more of these in Austin, especially after a child this year was struck and killed by a speeding car while he was playing in front of his home in Southeast Austin. This was on top of a number of other auto-pedestrian deaths this year. Very tragic. And in 2011, there were 21 auto-pedestrian deaths in Austin. Horrendous. Back in Austin, and the Which Way blogger hasn't had any time to blog! 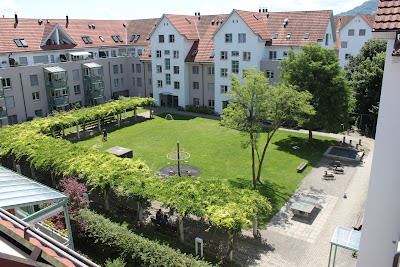 Here is a quick post with a great photo my sister-in-law sent me, taken from her apartment in Zurich. Her apartment complex is a lovely example of family-friendly courtyard housing, which I first blogged about from Grenada, Spain. The key attribute of courtyard housing is the shared open space. When the space is designed well, it provides a wonderful area for kids to safely play, offers a green oasis for people of all ages, and nurtures the building of community among the residents. My sister-in-law's complex contains a number of these courtyards, each of which have a secured entry and provide for a safe place for children to run around and play, as long as there isn't a snow storm in the works. Notice the sand box in the shade, ping pong table, and spaces for kids to ride around their trikes. The Which Way blogger is back in Austin recovering from jet lag, the Texas heat, and the reality that our vacation is over. This is especially hard to do when your kids wake up at 3am ready to go for the day. After I recover, I have more trip wrap-up posts to come, along with more blogging on family-friendly cities. For now, in the interest of getting sleep, I am just posting the playspace photos that I promised to send out. 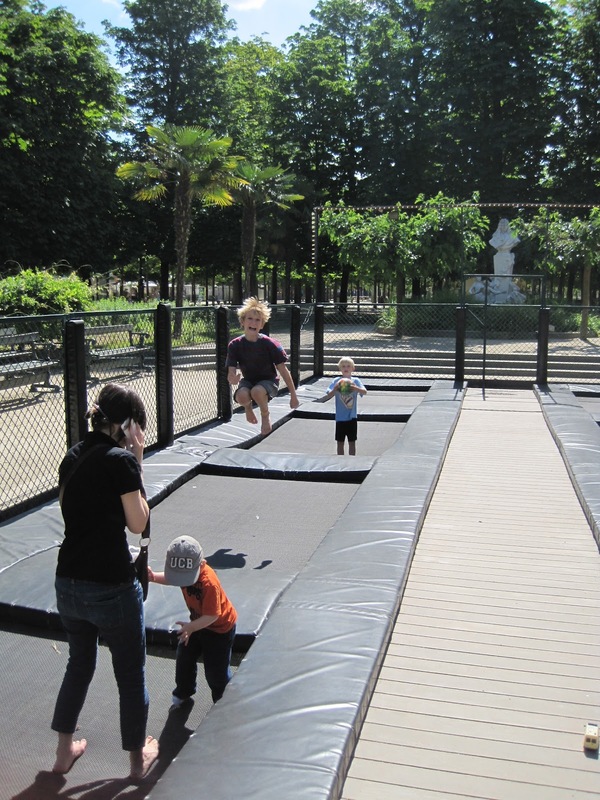 Truly amazing stuff, those Parisians and their playspaces for children. Here is a slideshow with some of the favorites we came across during our three days in Paris. Click here to view with the captions. We arrived in Paris Sunday night and have relished every minute of our time here in the city. For many tourists, coming to Paris means strolling down along the Seine late at night, spending hours getting lost in museums, and sipping a cafe au lait while reading a novel in a street-side cafe. While these things usually go by the wayside when traveling with youngsters, Paris with children can still be just as delightful. Paris is a dreamland for children, filled with amazing parks, children playspaces, engrossing public art, and lively public plazas. Joined by my two-year-old nephew and sister-in-law who are here with us from Zurich, we spent the morning yesterday at the Jardin des Tuileries, one of world's oldest public parks. The park is filled with child-oriented attractions, including a pond where kids push boats around, a carousel, built-in trampolines, public art that kids can touch and climb on, and a see-saw with other play equipment. In the afternoon, while my nephew napped back at our apartment with my sister-in-law, the rest of us fit in a visit to the Louvre, although within an hour my kids reached their threshold for "viewing art without being able to touch it or run around." Our favorite part of the day was the time we spent in the evening hanging out at the Stravinksy Fountain plaza. The kids loved running in and out of the moving water spray from one of the fountains (in the shape of red lips), we all loved watching the public street performers and people passing through, and the kids even fit in some time kicking around their ball with a Parisian boy until the ball ended up in the fountain. 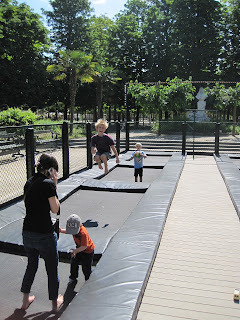 I have been taking lots of photos of Paris playspaces for children. Will post them in a set tonight (after we finish our last day here). Onto Texas tomorrow. We departed Spain yesterday after a month of learning Spanish, eating tapas, and enjoying so many different parts of the country. We are very thankful for our time there -- and also for Spain's Eurocup victory on Sunday (except for my oldest son who switched his allegiances from France to Italy). Stop off at pocket park playground after dinner in Seville. 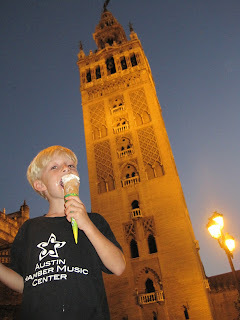 On our last night in Seville, as we walked through the central city for dinner, I continued to be struck by Seville's urban landscape and how it supports raising families with children in a dense environment. On that last night we walked twenty minutes to dinner through car-free pedestrian corridors, stopped off at a pocket park playground, and enjoyed our passage through numerous public plazas, taking in the sights and sounds of the people gathered there. We came across many other families with children doing the same as us. In Seville, which has a population density six times greater than Austin's, children are very much a part of the urban fabric. Throughout our walks in Seville we saw families walking out of 5-story apartment buildings, tots riding their trikes in public plaza, and parents pushing babies in strollers. (At some point, with all the babies we kept seeing, I began to worry that maybe there was something in the water!). In Austin, where urban densification and redevelopment has pushed families outside our city's urban core, I am excited about the lessons that dense but also family-friendly cities like Seville can offer our city to draw and retain more families with children in the urban core. Now in Paris. Potential future blog posts to come. and area around the Cathedral.